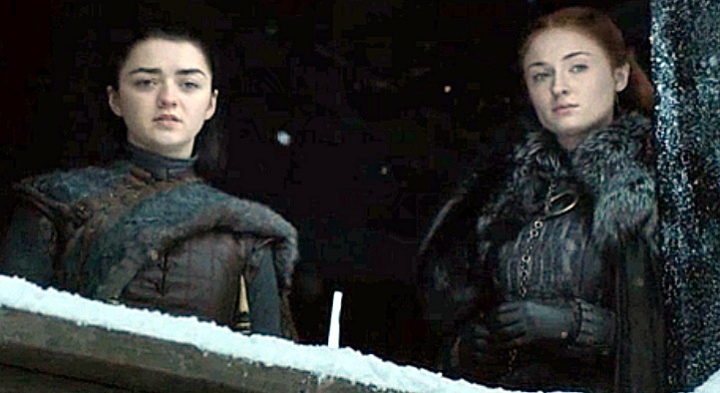 And, consider that very last moment where our focus was once again directed to the Catspaw dagger, which Littlefinger recently gave to Bran, who passed it to Arya who in turn, fancily flips it to Sansa. That scene was odd and worrisome. 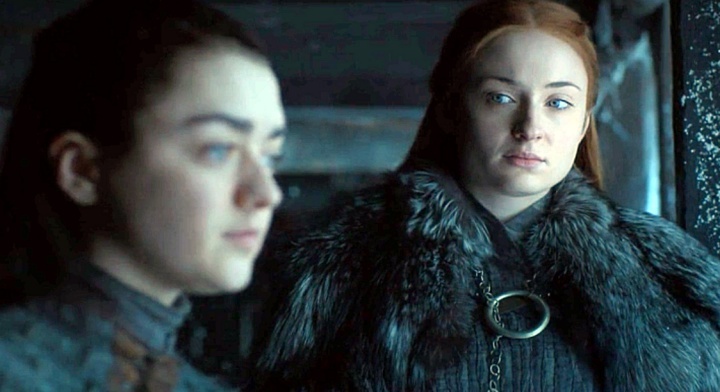 Why is Arya so aggressive toward her only sister; after they’ve already lost so much of their family and with so many enemies around them, shouldn’t Arya be protective rather than threatening Sansa? It’s something that’s bothering a lot of fans, with some going so far as to call Arya’s behavior “psychopathic”. In a post-episode interview, “Beyond the Wall” director, Alan Taylor potentially creates even more concern with his comments about the sisters. Speaking about what he wanted to create with that scene between the Stark women, his intentions were apparently near-murderous. Taylor also gave quite a disturbing hint at this week’s season finale events. While your first thought might be — does he mean they’re going to have an actual physical fight? — upset, or even filled with anger, what if the comment is further, sly misdirection? The pieces have all been put in place for Sansa to be in danger. Arya is seemingly angry and eerily sinister toward her sister. Sansa sent away their protector, Brienne (of effing Tarth! ), leaving the Starks alone with Littlefinger. Taylor hints at violence between Arya and Sansa; Sansa has the Catspaw dagger. But, not for one second do I believe these sisters, who’ve both been through unimaginable horrors, are really about to turn on each other. Taylor’s words refer to another. Either Sansa will come to her own discovery about what Littlefinger’s been up to, something will happen between them, Bran will warn her, or Littlefinger will simply go one step too far in deed or affection, and Sansa will get into a physical altercation with him. Alternately, Arya will go after Littlefinger, and he’ll somehow get the upper hand, with Sansa stepping in to stab him with that fateful dagger. I’d expect Arya to save her sister, though Sansa saving Arya would be a grand way for the scene to turn. We’re meant to think the sisters are at odds, but in the end, they’ll defend each other against a common foe. The surprising, violent thing between them will be Baelish’s murder. Game of Thrones just shy of eighty minutes, seventh season finale, “The Dragon and the Wolf” is directed by Jeremy Podeswa, and airs on HBO this Sunday, August 27th. Tags: Alan TaylorArryAryaArya Catspaw daggerArya gives Sansa the Catspaw daggerArya kill BaelishArya Sansa surprising violentArya StarkArya x SansaBaelish death Game of Thrones finaleBaelish's murderBeyond the WallBran Catspaw daggerCatspaw daggerDo Sansa and Arya kill Littlefinger together?Game of ThronesGame of Thrones finaleGame of Thrones S7 E7Game of Thrones Season 7Game of Thrones Season 7 finaleGoT finaleHBOHow long is Game of Thrones finale?Jeremy PodeswaLady of WinterfellMaisie WilliamsSansaSansa and Arya kill BaelishSansa and Arya kill LittlefingerSansa Arya violentSansa Catspaw daggerSansa kill BaelishSansa StarkSansa x AryaSophie TurnerStark SistersStark sisters kill LittlefingerStark sisters murder Baelishsurprising and violentThe Dragon and the WolfThrones finale The Dragon and the WolfWhat's the Game of Thrones Season 7 finale called?What's the GoT finale called?Who has the catspaw dagger?Who will die in the Game of Thrones finale?Who will kill Baelish in Game of Thrones?Who will kill Littlefinger?Will Baelish die in the Game of Thrones finale?Will Sansa and Arya kill BaelishWill the Stark sisters kill Littlefinger?